The Oregon Employment Department released the preliminary July employment estimates today. On a seasonally adjusted basis, total nonfarm employment in July was 1,597,000, down 3,000 from June’s upwardly revised figure. June’s emloyment, previously estimated to have declined by 3,600, was revised to show a gain of 1,800. June’s revision occurred due to additional information that was unavailable prior to the last reporting date and the upward revision was concentrated in the Professional and Business Services and Government sectors. Overall, Oregon’s July employment report is largely similar to that of the national report. The headline decline in employment is largely to government employment falling due to a decline in Census workers and also cuts made at the local level. Oregon’s private sector added 2,200 jobs in July. The sectors with the largest increases are Construction (+3,500), Nondurable Goods Manufacturing (+600), Retail Trade (+400) and Professional and Business Services (+700). Wholesale Trade (-600), Financial Activities (-900) and Educational and Health Services (-2,600) saw the largest declines in the private sector. On a year-over-year basis, employment fell 10,600 between July 2009 and July 2010, or 0.66 percent. I just want to highlight the fact that the private sector added jobs in July for the third time in four months. April (+2,200), June (+1,500) and July (+2,200) all saw increases. 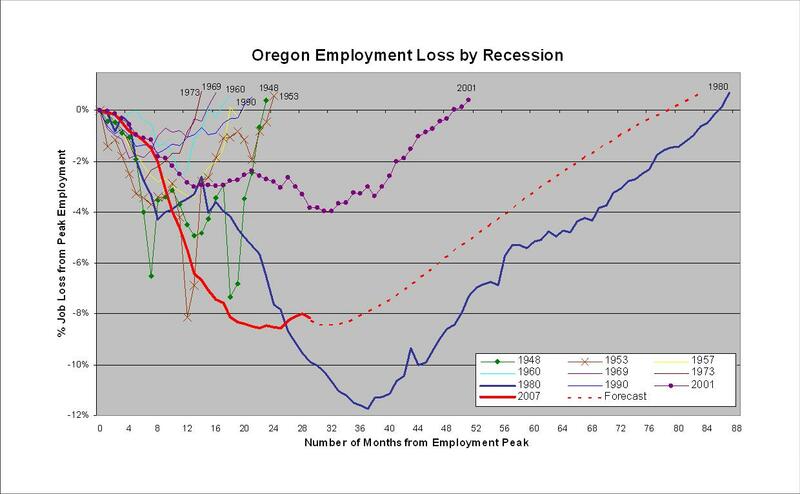 The last time Oregon experienced private sector job growth in three out of four months was the November 2007 through February 2008 time period, or right at the beginning of the recession. Even though the gains are small, historically speaking, and have barely begun to put a dent in the total job losses this recession, at least the numbers are moving in the right direction. On a monthly basis, employment in Oregon peaked in February 2008 and has declined in 25 of the 29 months since. Total job loss since peak employment is 142,100, or 8.17 percent. 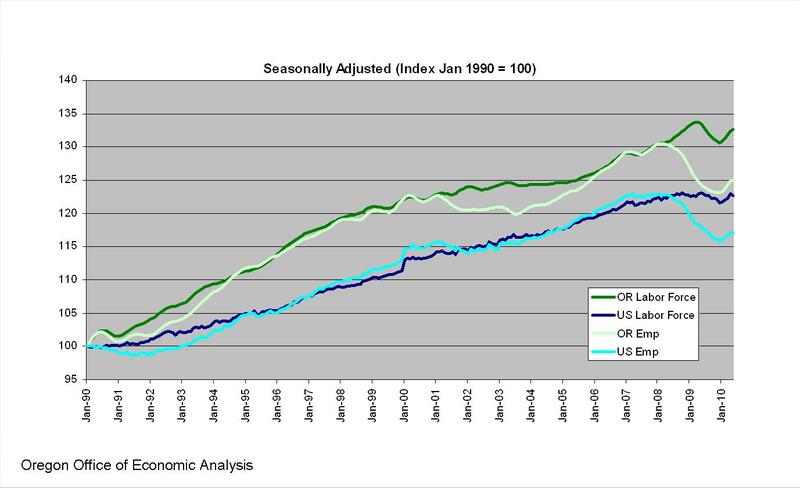 With the recent employment reports indicating a bottoming out in the labor market, the current recession is now not quite as bad as the early 1980s recession in Oregon. 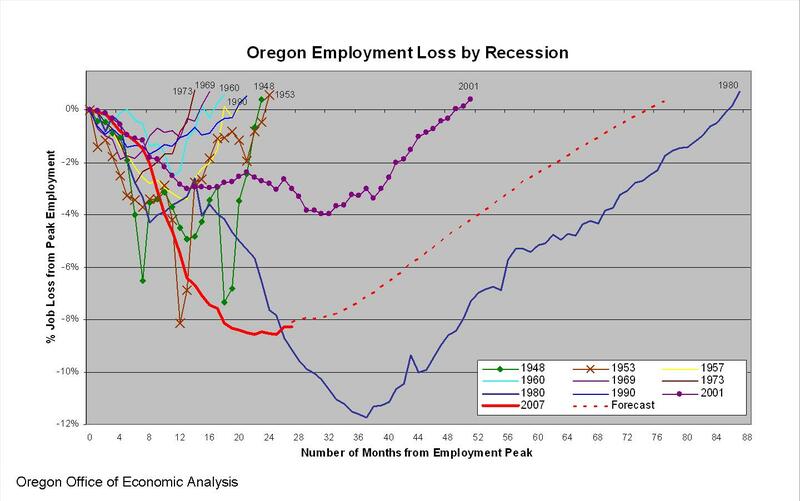 Twenty-nine months into the early 80s recession, Oregon employment had fallen 9.9 percent from its peak, or a little more than 106,000 jobs. All told, employment fell nearly 12 percent between late 1979 and late 1982, or a total of approximately 126,000 jobs. The current recession has seen a larger total loss of jobs, however as a percentage of the total peak employment, job losses this recession are forecasted to be smaller than in the early 1980s. One sector that added jobs earlier this year is the federal government, due to increased temporary hiring for the decennial U.S. Census. As the Census unwinds, federal government employment will continue to decrease. At the national level in July, 143,000 employees were let go after completing their Census assignments. As noted by the Oregon Employment Department in its report, Census workers in the state declined 1,839 from June to July. This decrease in Census workers accounted for over a third of the overall Government employment losses in the state last month. 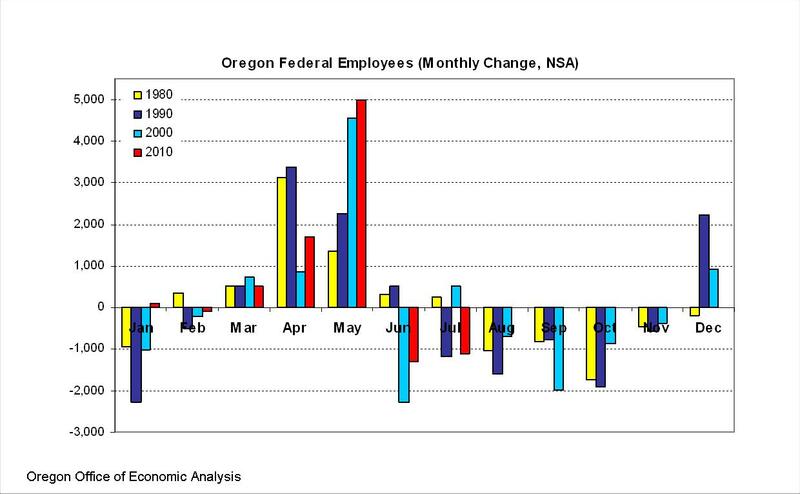 In Oregon, on a non-seasonally adjusted basis, Federal Government employees decreased by 1,100 from June to July. 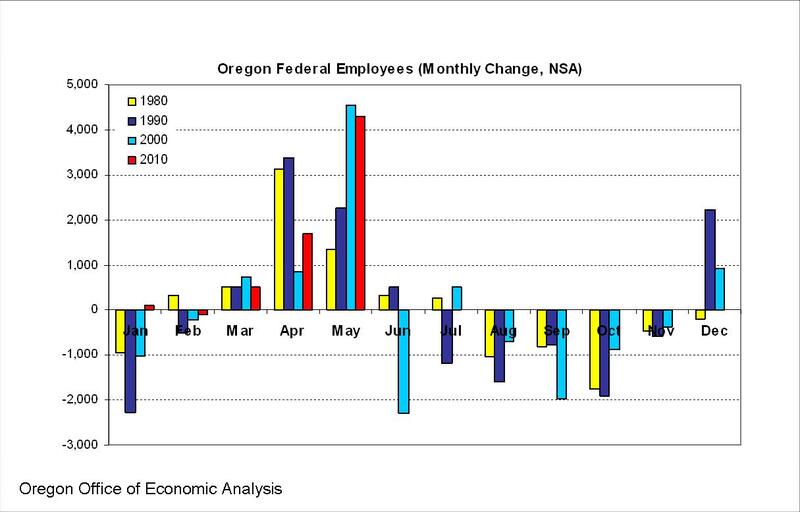 The graph below illustrates the monthly changes in Federal Government employees in Oregon during the recent census years. Also included in the July report was the unemployment rate estimate. On a seasonally adjusted basis, Oregon’s unemployment rate was 10.6 percent in July, essentially unchanged from the 10.5 percent in June. The unemployment rate in July 2009 was 11.4 percent. Since peaking in May and June 2009 at 11.6 percent, the unemployment rate has fallen one full percentage point over the past year, however it remains essentially unchanged over the past nine months. The unemployment rate is based on what is commonly referred to as the “household survey”, which provides monthly estimates on the number of labor force participants and the levels of employment and unemployment. After increasing in late 2009 and into early 2010, both the number of labor force participants and the self-reported employed have moved sideways in recent months. 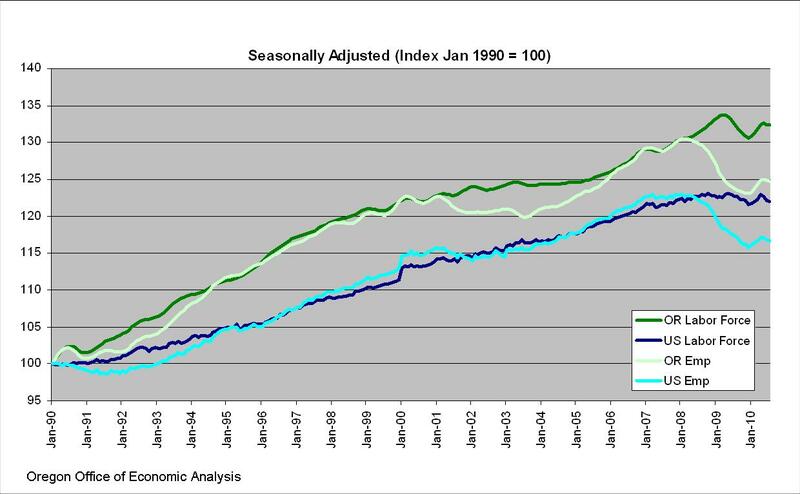 As both series move together, the unemployment rate holds steady around the 10.5 – 10.7 percent range.